Isn’t it tiring always having to open iCal to take a quick glance at your schedule? With a program called iDeskCal, this problem no longer exists. 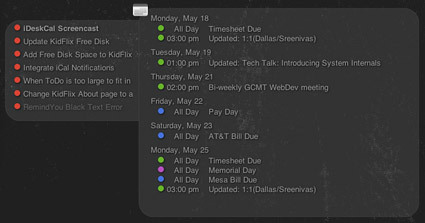 You can view a nice list of events (and To Do tasks) right on your Mac’s desktop. A couple weeks ago I realized I had a problem. No, I’m not an alcoholic… the problem is that I spend a ton of time keeping my personal calendars up-to-date in iCal and never actually look at them! Appointments, birthdays, and deadlines could fly right by and I wouldn’t even know. I’m so absent-minded that I can’t even remember to open iCal and take a peek at my upcoming schedule. Sound familiar? If so, a utility called iDeskCal might just be your new best friend. Developed by HashBang Industries, iDeskCal is a $12.99 application that embeds your iCal calendars right on your Mac’s desktop. When you turn your computer on – bam! – there it is. It’s impossible to miss and doesn’t get in the way, which is exactly what forgetful neat-freaks like myself need. And if the screen is littered with open windows, just invoke Exposé with a simple keystroke to temporarily show the desktop. Events are listed by day with their times and are even color-coded to help identify which calendar they belong to. Pending To Do items are listed separately off to the side as well. While iDeskCal is running, an icon is displayed in the menu bar (and/or the Dock if you choose to enable it). A number of options reside in this menu, including the ability to add events to iCal without ever opening the program itself. 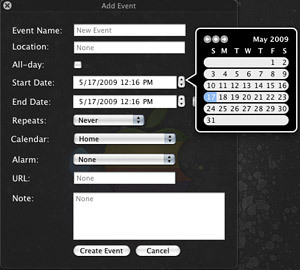 A semi-transparent window floats on top of the screen with all the fields required to create new events. Also accessible from iDeskCal’s menu bar icon is a To Do manager that lets users add, edit, and delete To Do tasks – again, without launching iCal. One of the great things about iDeskCal is that it’s highly customizable. The developer doesn’t force a particular style or appearance on you – many visual choices are user-configurable. Going to Preferences in the menu bar drop-down displays a slew of choices for font, text size, text color, position on the screen, and background opacity. Since iDeskCal sits on top of the desktop wallpaper image, these settings will likely need to be changed to match your personal preference. After spending some time with iDeskCal, I’m confident in saying that it has changed my daily life for the better. Being able to show iCal events on the desktop has already saved me from forgetting one birthday and will surely continue to do so as time goes on. If you’re a regular user of iCal who has a Mac running 10.5 or 10.6, I see no reason for you not to give iDeskCal’s 14-day free trial a shot. The convenience and productivity improvements it brings will surely convince you to put down $12.99 for a full license. Win a free copy of iDeskCal! After I discovered iDeskCal could solve my own calendar deficiencies, I contacted the developers to see if they would be interested sharing the goodness. It turns out they are! HashBang Industries has been kind enough to offer a free software license of iDeskCal (regularly $12.99) to one lucky MacYourself reader! To enter, please leave a comment below, along with a valid email address (this is how we will contact you). In order to avoid spam filter issues, please type a coherent sentence saying you’d like a chance to win. If you want to make this more fun, feel free to share a story about forgetting some important event in your life. An anniversary, maybe? Your story (or lack thereof) won’t affect your chances of winning. It’s just for entertainment purposes. Multiple entries will be deleted, so please only add one comment per person. And finally, don’t worry if your comment doesn’t appear on the site immediately — it might be awaiting moderation and will show up shortly. A winner will be chosen at random based on the comment number they happen to be. The lucky guy or girl will be announced on this page, so bookmark this article and be sure to check back later. All entries must be made by December 11, 2009 at 11:59pm eastern U.S. time. In the meantime, download a free trial of iDeskCal to try it out for yourself. Good luck! Congratulations to our winner Ariel! Her comment number was chosen from a random number generator and she has been given a free copy of iDeskCal! Thanks to everyone who entered and remember to consider purchasing a copy of iDeskCal yourself if you’re an avid iCal user. iPhone calendar syncing wrong event times from your Mac’s iCal? I would love a copy of the software! I use iCal all the time to remember assignments for college, and this looks pretty cool. Come on lucky number two! Nice app. I use a widget for this end, but this sounds like a good alternative. Great, I’d love to win. Thank you very much for the article! I’d like a copy of iDeskCal! I’ve also been burned by forgetting a birthday. My wife’s! It was a few years ago and I tried to weasel my way out of it with some grand scheme about a pending surprise. Needless to say I was full of it. Count me in, sounds like a great app! I also would love to win this app! Thank you! What nice app! I’d surely be glad to win it! I tried it for free and i find it awesome! Am I on time for the win?